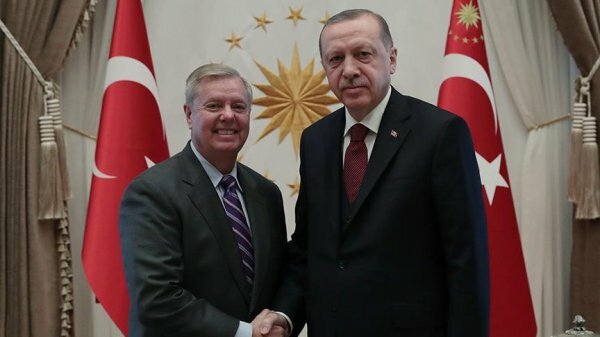 US Senator Graham stated that US should protect Turkey and solve YPG/PKK problem that was created for Turkey in Syria in his meeting with Defense Minister Hulusi Akar. YPG/PYD is 'clearly' tied to globally recognized terrorist group PKK, says Senator Lindsey Graham during Ankara visit. By arming the YPG group in Syria, Washington “created a nightmare for Turkey,” said a senior US senator during a visit to the Turkish capital on Saturday. Senator Lindsey Graham told reporters that the US strategy in Syria has the potential to cause harm to Turkey. The South Carolina senator stressed the importance of protecting Turkey and solving the problem the US “created” for Ankara, referring to Us support for the terrorist YPG/PYD in the name of fighting Daesh terrorists. Graham, a member of Congress since 1995 and a senator since 2003, serves on the Senate's Armed Services Committee. Turkey has long objected to the US giving support and weapons to the YPG/PYD, arguing that using one terrorist group to fight another makes no sense. Turkey has said it will soon launch a counter-terrorist operation against the YPG/PYD in Syria, east of the Euphrates River, near the Turkish border. Graham’s visit to Turkey came amid attempts by the two sides to reach an agreement on the expected withdrawal of US forces. US President Donald Trump announced his plans to immediately withdraw the approximately 2,000 US troops deployed in Syria last December.